Air Playit allows user to stream video/audio to iPhone, iPad, iPod, Android over the local network and even through the Internet. It acts as a personal video audio cloud to stream video audio no matter where you are and share favorite video audio with friends and family. How to Stream Audio/Music to iPhone, iPad, iPod with Air Playit? How to Stream Video to Android mobile devices? 2. Please make sure your system complies with the minimum system requirements of the software. 1. Air Playit Server is powerful media server software. Download and install the PC or Mac version according to your computer. 2. Air Playit is a client app, acts as a personal video & audio cloud. Downloading and Installing Air Playit Client on your Apple (iPhone/iPad/iPod Touch)/Android device. 1. On the main interface, it will show you the port and IP address, which may be used to specify the server address when the client app can't find the Bonjour connection information. 2. 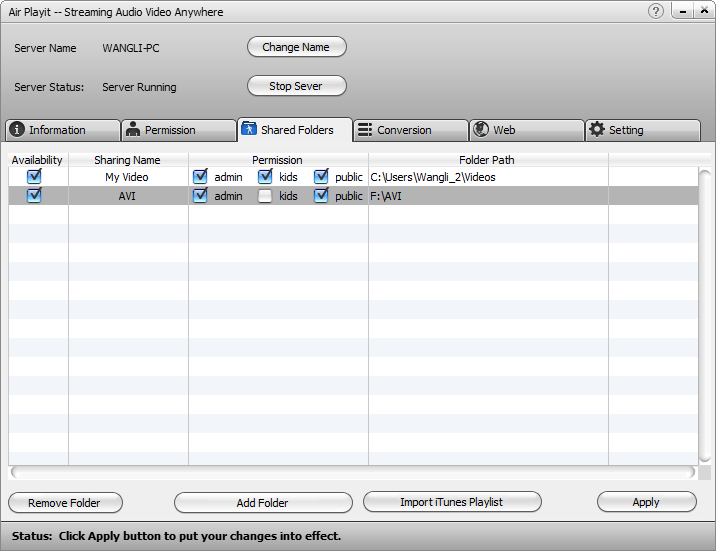 Select directories on the video server that contain your videos or import video from your iTunes playlist to share. 3. Set access permissions as you need after well selected the video and audio to share. It includes Admin, Kids and Public. 4. 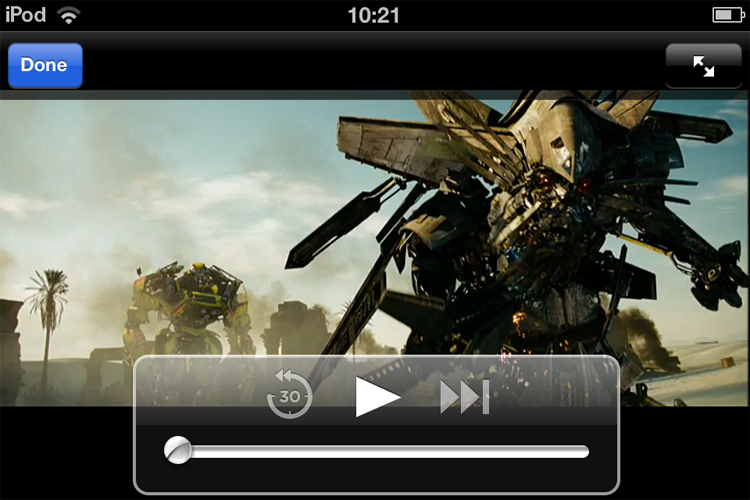 Air Playit allows you to access the playlist via web browser. You can activate this function by click the "Web", select and apply. Then you will be displayed with a URL to visit your server by web browser. 5. You can add and manage the offline conversion task under the conversion tab by clicking "Add video conversion task". This can also be finished on your portable devices. 6. This free video streaming app allows you to set the output folder for the converted files. Just click setting and choose a destination for the video & audio converted offline. Step One: Start up the Air Playit app on your iOS devices and add your server. If sometimes the client app can’t find the Bonjour connection information, you need to specify the server address manually or close the firewall for a try. Step Two: Browse the folders under the server, Click "Play" to watch the video. If the video format is not supported by portable devices, it will convert the video on the fly automatically, no need to wait before watching. Option: Before you play the video, you can also adjust the parameter settings by clicking "Playback Setting" Here you can switch the network connection type among WiFi, 3G, 4G and change the video resolution, bitrate, audio, subtitle, etc. Step Three: If you want to speed up the playback or convert the video from PC/Mac to your portable devices, you can click "offline conversion" and choose the target portable devices. Step Four: Air Playit enables user to download videos to portable devices by clicking Download to iPod touch, Download to iPad, Download to iPhone. 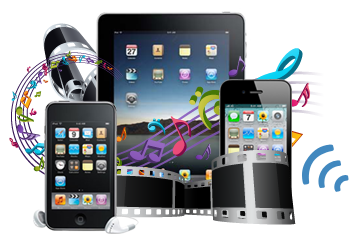 If the video is not in the format supported by iOS devices, you can convert the format first by offline conversion. The converted video can be found in the folder named "Air Target". Then follow the general download step, you will find the downloaded videos in the "Download Library". Step One: After well installed Air Playit server and client app, add your server first. Step Two: Select a music or audio file that have been shared by Air Playit server and play it. It will automatically convert the format and download to your portable devices when you are listening. Step Three: The audios that have been played will be saved on the "Download Library". Step One: After well setting the Air Playit Server. Launch the Air Playit app on Android devices and add your server. Step Two: Browse the folders under the server, then select the video file and click "Play" to watch. You can also download it to your device directly if it is in the range of supported format. 1. If the video format is not supported by your Android devices, turn on the "Force Convert" to activate the live conversion function, so you can watch them without any difficulties. 2. The offline task manager enables you to add and manage video conversion tasks. After offline conversion, you can download them to your devices by following the general download steps. It make it easy for you to play converted videos on Android later when no network is accessible.